It's easy to add new customers in-store, through your Vend POS sale screen on Laptop or Desktop. To add a new customer to your Marsello program, all your need to do is add the customer to the sale in your Vend Register. 3. 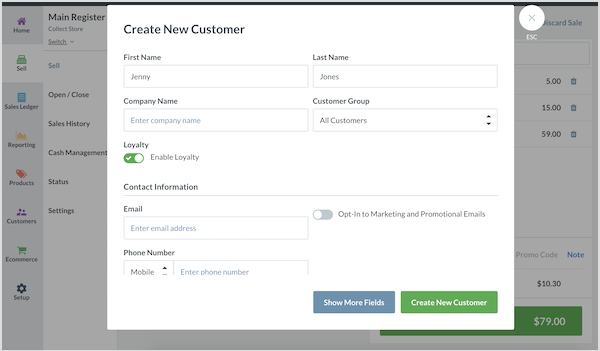 Add your new customer's First Name, Last Name and Email Address. This is the only required information for your customers to be added to your loyalty program. 📝Note: If you have customers in-store that aren't interested in being part of the program, simply leave the email field blank, and they will not be counted as members. The customer will be automatically added to your loyalty program. Their details and purchase data will sync to your Marsello account. They will earn points for their purchase and if you have your Earned Points Email turned on, they will receive their first loyalty email. After you have completed the sale, your customer will be a member of your loyalty program. They will automatically receive a loyalty points update email (if turned on), then they can request their points balance and available rewards next time they are in-store. Ask every customer who shops if they want to join your loyalty program. Let your customers know about your rewards to get them excited about joining, "Earn 1 point for every $1 you spend and unlock exciting rewards". You may also consider creating in-store promotions to get visitors interested in the program.